This morning my Knights of Columbus Council #12992 held one of its monthly breakfasts. These are important for several reasons. To start with, we raise funds to use in our community service projects. Additionally, it’s a really nice way for members of the Parish to enjoy a good healthy meal and visit with each other after Mass. If you haven’t been to a KofC breakfast then watch the video to see what you’re missing. I don’t get to attend a lot of our events due to work travel but when I do I get some photos and add them to our website and online photo album. My Knights of Columbus Council 12992 met last night. It was very gratifying to see our Grand Knight pull out his rosary before we got started and lead us. This is the month to especially honor our Lady and she means a lot to members of the Knights. 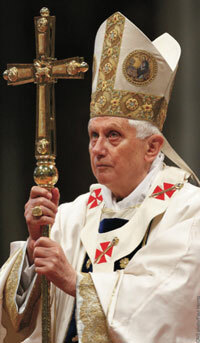 When we become members we receive a rosary like the one in his hands in the photo. 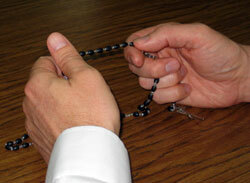 All Knights are encouraged to use their rosary daily, especially during this month. I’m a member of the Bishop Michael F. McAuliffe Knights of Columbus Council 12992. 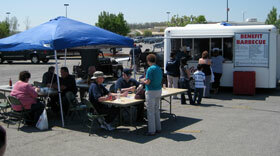 Each year we hold a benefit barbeque to raise money to support pro life causes. Except for a little bit of wind we had a beautiful day for it today. I manage our council website and have an online photo album for council activities which I’ve added a number of photos to from today’s event. We have a great time and meet a lot of wonderful and hungry people. You might just guess what’s for supper in our house tonight! Here’s a familiar scene to Catholics around the country this Lenten season. 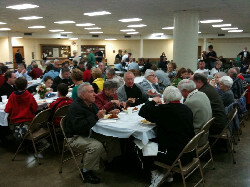 The Friday night Knights of Columbus fish fry. This is my Council 12992 and in the photo our Bishop joined us for supper. We’ll be doing it again this Friday too. The only thing I would caution is to eat in moderation. Remember it is Lent and although we aren’t required to fast it’s not a bad idea to resist the temptation for an extra helping. Consider it a small mortification. Pope Benedict XVI Saturday approved a decree recognizing the heroic virtue of Father Michael J. McGivney, founder of the Knights of Columbus. The popeâ€™s declaration significantly advances the priestâ€™s process toward sainthood and gives the parish priest the distinction of â€œVenerable Servant of God.â€ If canonized, Father McGivney would be the first American born priest to be so honored.